1. First you need to locate the business or organization on the map page. Use the zoom controls +/- and drag the map (or use the pan arrow controls) until you have located the location of the place to add. You must zoom into a detail level to be able to add a point. Click on the exact location on the map where the place is located and press Ok to confirm you want to add a listing at that point. Or, if you know the latitude and longitude already (to at least 4 digits of precision after the decimal point) you may also just enter them below. Use numeric values like 9.655923 and -82.753143, not the values with degrees, etc. What type of point is this? This site is fully bilingual (English/Spanish) so the following information needs to be provided in both languages so your listing is shown correctly in the user's preferred language. Enter a description (up to four lines) to be published on the map. Please use 3rd person (it/they instead of we) and do not use ALL CAPS. Re-enter the above description in a Spanish language version. You may upload a photo from your hard drive to accompany your listing if you like. Your photo will be automatically resized but to upload must be no more than 5MB. Phone number (not including 506 country code). This will be shown on your listing. Email address where reservation and other inquiries from customers should be sent. Does this business have a website? This must be for the official website maintained by the business itself. Third party websites which list many hotels, etc will not be accepted. • Your website is linked right from your listing on the site. Listings with weblinks show as many as 200 unique visitors a month from Puerto Viejo Satellite to their website — think how many additional clients that could be! • Your link is direct to your website which will improve your own site's search engine rankings. • A photo accompanies your listing wherever it appears, making it stand out and grabbing the customer's attention. • On your detailed listing page you can have up to 3 photos in a photo gallery. • Listings with a weblink/photo upgrade are also featured more prominently on the category pages such as lodging and restaurants and on the area pages such as Punta Uva. • Your facebook page is integrated right on your Puerto Viejo Satellite page (people can like your facebook page right from your detailed listing page). 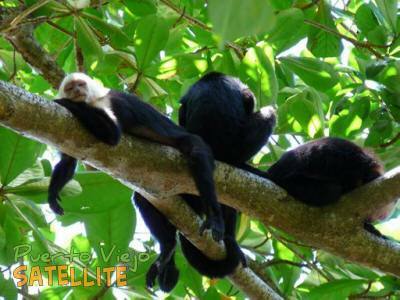 • Your twitter account is linked from your Puerto Viejo Satellite page. • Top Pick listings are shown on every page of the site (in the green Puerto Viejo Top Picks box) with a link to your website and an extra line of text promoting your listing. • Top Pick listings are also featured most prominently on category pages such as the lodging or restaurants and in area pages such as Manzanillo. • On your detailed listing page you can have up to 10 photos in a photo gallery. • The detailed listing page for Top Pick listings is wider and free of the Top Picks banner to other listings so your listing will take center stage. • Top Pick listings are listed as a favorite page on the Puerto Viejo facebook page and Top Pick listings may request promotional posts on our facebook feed when you have a special or event or news to promote. • Top Pick listings allow you to customize your listing with special offers and a custom URL for the Reserve Now button. Feature your listing for only $249USD a year for accommodation or tour/activity listings or $219USD a year for other types of listings. Just the free listing for now, thanks. Not published but required in case we need to contact you regarding your submission. 5. Your business will appear on the map after it is reviewed by our editors. We reserve the right to reject entries for any reason.